Vitamin D is synthesized endogenously, but can also be found in fatty fish, fish oils, meats and fortified milk. Vitamin D crosses the blood brain barrier and has been associated with regulating neurotrophin growth and neurotransmitter signaling. Deficiencies in Vitamin D may affect executive brain functions, such as the processing of information, working memory, and multitasking. Many healthy individuals, particularly working professionals working indoors, may be asymptomatic and have vitamin D deficiency, due to decreased exposure to sunlight. 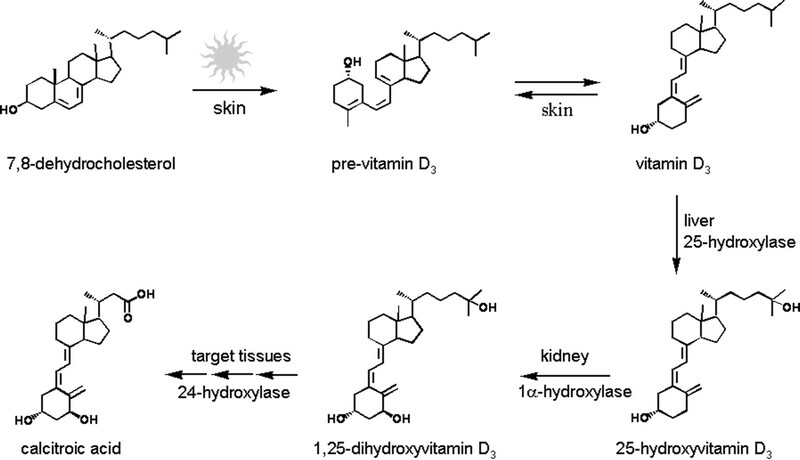 Vitamin D is endogenously synthesized from cholesterol. UV exposure from sunlight is a key component in this process. Vitamin D is synthesized endogenously in the body and brain. Vitamin D is also an essential nutrient found in fatty fish (such as salmon, tuna, flounder), fish oils, meats, eggs, and fortified milk. Many people also consume it in supplement form - Vitamin D3 is preferable to D2 as it is more efficiently absorbed. However, low vitamin D levels were associated with depressed mood in a study of young adults in the US11. Daily supplementation of 4000 IU of Vitamin D ameliorated depressive symptoms in a study of adolescents with low Vitamin D [hogberg-2012-vitd-depression] but this result is not consistent across all populations. Current scientific consensus is that supplementation may be protective for healthy individuals, particularly in vitamin D deficient individuals. As previously mentioned, many healthy individuals may be asymptomatic and still have vitamin D deficiency12. Working professionals are at particular risk for deficiency due to increased time spent inside. Vitamin D levels are at their lowest in the winter due to decreased exposure to sunlight. Vitamin D deficiency is correlated with increased risk of Alzheimer's [annweiler-2013-vitd-alzheimers] and Parkinson's disease [knekt-2010-vitd-parkinsons], possibly due to its neuroprotective effects. However, at this time, further research is required to better characterize these relationships. Low 25-hydroxyvitamin D [25(OH)D] concentrations are associated with increased risk of mortality, and higher levels of vitamin D in blood predict lower overall mortality. In the largest meta-analysis including 850,000 study participants across 73 cohorts with ~66,500 deaths, comparing those with levels of 25(OH)D <25 nmol/l vs. those with levels ≥75 nmol/l, the relative risk of death was 1.50. The second largest meta-analysis, including 500,000 study participants, comparing those with levels of 25(OH)D ≤22.5 nmol/l vs. those with levels >75 nmol/l, the hazard ratio for death was 1.90. Studies suggest that the lowest mortality risk were found in individuals with 25(OH)D serum concentrations ranging from 75-88 nmol/l. Vitamin D supplementation (2,000 IU a day of vitamin D3 for 4 months) was associated with increased telomerase by about 20%, as measured by telomeric repeat amplification, in overweight African Americans. This suggests improved telomere maintenance, counteracting obesity-induced acceleration of cellular aging. Most vitamin D supplements come in "IU" or international units. The recommended daily allowance for Vitamin D is currently set at 400-800IU/day, for moderate supplementation, a 1,000-2,000IU dose of vitamin D3 is sufficient to meet the needs of most of the population. Vitamin D should be taken with a good source of fat like fish oil for optimal absorption. It can be hard to get enough vitamin D from diet and sunlight alone, depending on where you live. Vitamin D supplementation should not cause side effects. Combination with calcium supplementation may increase risk of kidney stone formation. Vitamin D can be toxic at very high doses leading to hypercalcemia and calification. However, hypercalcemia only occurs at 25(OH)D levels above ~375 to 500 nmol/l with very extreme overdosing of vitamin D.
Vitamin D is approved as a dietary supplement component under provisions of the Dietary Supplement Health and Education Act of 1994. It is classified as generally recognized as safe (GRAS). Brown, J., Bianco, J. I., McGrath, J. J., & Eyles, D. W. (2003). 1,25-dihydroxyvitamin D3 induces nerve growth factor, promotes neurite outgrowth and inhibits mitosis in embryonic rat hippocampal neurons. Neurosci Lett, 343(2), 139-143. Naveilhan, P., Neveu, I., Wion, D., & Brachet, P. (1996). 1,25-Dihydroxyvitamin D3, an inducer of glial cell line-derived neurotrophic factor. Neuroreport, 7(13), 2171-2175. Balion, C., Griffith, L. E., Strifler, L., Henderson, M., Patterson, C., Heckman, G., . . . Raina, P. (2012). Vitamin D, cognition, and dementia A systematic review and meta-analysis. Neurology, 79(13), 1397-1405. Tangpricha, V., Pearce, E. N., Chen, T. C., & Holick, M. F. (2002). Vitamin D insufficiency among free-living healthy young adults. Am J Med, 112(8), 659-662.